From the medicine we take, the treatments we receive, the aptitude and psychometric tests given by employers, the cars we drive, the clothes we wear to even the beer we drink, statistics have given shape to the world we inhabit. For the media, statistics are routinely ‘damning’, ‘horrifying’, or, occasionally, ‘encouraging’. Yet, for all their ubiquity, most of us really don’t know what to make of statistics. Exploring the history, mathematics, philosophy and practical use of statistics, Eileen Magnello – accompanied by Borin Van Loon's intelligent graphic illustration – traces the rise of statistics from the ancient Babylonians, Egyptians and Chinese, to the censuses of Romans and the Greeks, and the modern emergence of the term itself in Europe. She explores the ‘vital statistics’ of, in particular, William Farr, and the mathematical statistics of Karl Pearson and R.A. Fisher. She even tells how knowledge of statistics can prolong one’s life, as it did for evolutionary biologist Stephen Jay Gould, given eight months to live after a cancer diagnoses in 1982 – and he lived until 2002. An enjoyable, surprise-filled tour through a subject that is both fascinating, and crucial to understanding our world. The task of putting the knockabout comedy into the subject of Statistics fell to me at the end of 2008. Like any reasonably discreet area of specialism (the sort often dealt with by 'Introducing' books) the world of statistics is a strange place for the uninitiated visitor. It has its own vocabulary and soon leaves the world in which we can relate its application to the everyday and enters a space which is a challenge for both author and illustrator. Apart from 'Introducing Darwin' where, by definition, we are dealing with a central character, I haven't worked on a book where one person so dominates the field of research and innovation: Karl Pearson. Given the crucible of thought, invention and revolution provided by the Victorian era which gave us Marx, Darwin and Freud, it shouldn't be a surprise that much of Statistics was developed and elaborated in that era. Some unexpected features: the importance of Florence Nightingale's pioneering use of statistics during the Crimean War to count the number of soldiers dying, wounded and recovering from treatment; also the significance of statistics in the brewing of Guiness in Dublin. 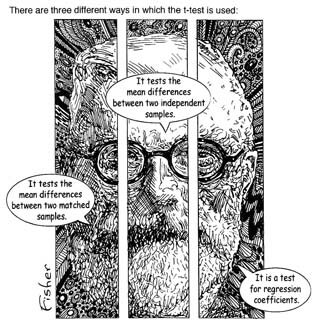 The fourth of the sample images above showing R.A. Fisher gives a nod of the head to a hero of the psychedelic era: Martin Sharp. His 1967 poster of Bob Dylan Blowin' in the mind (not to mention his cover for Cream's Disraeli gears album, not to mention his lyrics for Tales of brave Ulysses...) were a huge inspiration to Borin. This delightful book introduces both statistics and the history of statistics from tabulation and the calculation of averages in the 17th and 18th century, through measures of variation and association and the estimation of population parameters in the 19th century, to t-tests and the analysis of variance in the early 20th century. The combination of Eileen Magnello’s understanding of the history and Borin Van Loon’s entertaining illustrations (including recognisable portraits/caricatures of the main historical protagonists) make a book that is both charming and educational. Unfortunately there are a number of errors and inaccuracies in the statistical content. Before reading this book I had not realised how the Darwinian theory of evolution depended on and contributed to the awareness of statistical variation, nor the extent to which the normal distribution unduly dominated statistical thought and practice until Pearson demonstrated that many natural populations could be better described by other families of distributions. I hope that Magnello and Van Loon will bring out a corrected edition; meanwhile, if I asked students to read this book, I would offer a small reward for every error they identified in the text. I have sent Eileen Magnello a list of possible errors, inaccuracies and over-optimistic statements. Introducing Statistics: A Graphic Guide is a small book (c. 6" x 4") of 176 pages that supplies a compact history of statistics, both people and concepts, up until the first decades of the 20th century. 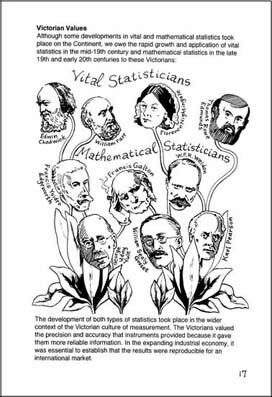 The text covers the contributions of the significant 19th-century statisticians including Florence Nightingale, Bernouilli, Gauss, Galton, finishing with Karl Pearson, Weldon, Gossett and Fisher. Embedded in the historical account are clear explanations and helpful examples of key statistical concepts including distributions, sampling, summarizing data, variation, correlation, regression, chi-squared, hypothesis testing, the analysis of variance, and a lot more. So it could provide an excellent resource for introductory statistics, if it were clear at whom exactly the book is aimed. There is no preface to indicate the target audience. An accompanying flyer, but not the cover text, suggests that university students will use it. This would be fine, but as there is no table of contents and locating a particular topic is difficult. There is an effective index, but in my experience students have no idea what an index is for. Navigating the text is actually made more difficult by the large number of drawings, which despite their high quality, do not convincingly assist the text substantially. There are too many disembodied talking heads, and even sketches of the author! Rightly, illustrations are used to support text explanations, but these instances tend to be in the minority. 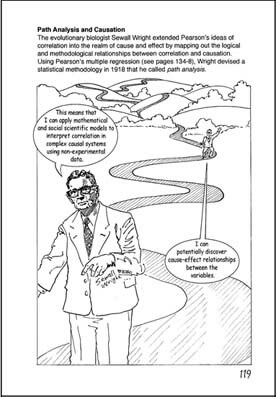 Graphics, humour and text can be combined effectively, as in Gonick & Smith’s The Cartoon Guide to Statistics (HarperCollins), but the combination is much less successful here. Also, rather strangely, this introduction to the history of statistics ends around 1925, although this is not entirely clear from the cover text. There is a simple reason - the author is a specialist in the work of Karl Pearson. However, the unwary might conclude nothing had occurred since then (which it has). One crucial positive feature is that this volume is extremely cheap, its online price being about that of a cup of coffee and a sandwich in your local cafe. After the distributor’s cut the publishers are almost giving it away. So, if you require a cheap, pocket-sized volume with clear, accurate explanations of basic statistical concepts, and you don't object to an excess of illustrations, then buy it now. A bargain. 'Statistics: A graphic guide' by Eileen Magnello and Borin Van Loon, review by Marianne Freiberger from the online mathematics magazine. "plus.maths.org"
"Statistics are emotive — to some they are just lies, to others perplexing, some fear their power to reduce us all to a single number, while yet others (politicians and journalists especially) like to endow them with qualities like "damning" or "deathly". So what are (or should it be "is"?) statistics all about? And what do we need to be wary of? This little comic-style book (from the Introducing series) provides some friendly answers in 176 pages and a handy A6 format. For those naturally scared of approaching this maths-heavy topic, the book provides an intuitive introduction set in historic and social context. Even for those who are not, it's a handy reference guide to some of the central concepts that is far more entertaining than your usual text book. The most striking thing about this book are the illustrations by Borin Van Loon. The text, written by Eileen Magnello, appears around them, within them, in speech bubbles, or even framing them, so rather than being little asides, the illustrations are absolutely central to the book. They depict a variety of things, from the obvious visual pun (Poisson has the body of a fish) to the downright bizarre. There are plenty of portraits of statistical protagonists in strange juxtaposition with what they were working on, women emerging from fat suits or living in other people's hair, giants, dwarves, cave men and three-armed mathematicians illustrating coordinates axes. This format is slightly confusing at first, but once you get your eye in, it turns what could be a rather dry experience into light reading, with your brain able to rest while you marvel at a picture or laugh at a cartoon. In terms of content, the greatest asset of the book is the context it provides. I personally am a recent convert to the marvels of statistics. At school and university, stats to me was a set of perplexing mathematical tools to be applied parrot-fashion to parrot problems, mostly to do with testing if a factory produces too many sub-standard nails. What I was lacking was the kind of historical background given in this book, which reveals just how fascinating the topic is. Rooted to a large extent in the social upheaval of the industrial revolution, modern statistics was driven by a desire to understand the masses and by questions that weren't about nails at all. Its results have affected millions — statistical observations led to important 19th century health reforms — and thrown up deeper questions about the meaning of averages and variation. Statistics is also a curiously double-edged beast: designed to analyse information with utmost objectivity, it's at the same time a powerful tool to mislead. 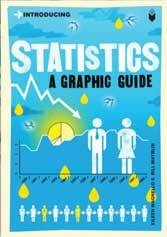 The book starts off by extending a reassuring hand to those who are nervy about statistics. It acknowledges its ambiguous standing, quoting Courtney's (and not Disraeli's!) obligatory "lies, damn lies, and statistics" and a hilarious "cigarettes are the biggest single cause of statistics" by an unknown columnist. But right at the start the book also makes the important point that mathematical statistics is not about averages, but on the contrary about capturing and measuring variation. There is an interesting reference to Darwin's work on natural selection, which represented an ideological shift away from the "idealised mean" bearing the essence of a species, and towards the variation that enabled it to evolve. As the book points out, Darwin was the first to view evolution as a statistical process. This type of philosophical shift, which occurred in the middle of the 19th century, combined with the Victorians' fascination with all things measurable provided the perfect breeding ground for modern statistics, as well as a starting idea of the book. In what follows we travel back to the beginnings of data collections, meeting the likes of Thomas Cromwell and the astronomer Edmond Halley, before delving into Victorian statistics, including Florence Nightingale's important statistical observations in military hospitals. The mathematical concepts begin in earnest with a section on probability theory, which then leads to all the concepts that should be part of a beginner's guide to statistics: probability distributions, the central limit theorem, different types of averages and how they can mislead, measures of variation and correlation, regression to the mean and how to fit models. The book ends with a pointer to inferential statistics, which has given us vital applications like opinion polls and medical statistics. The context provided throughout the book does wonders for mathematical comprehension. Once you understand the problems that faced the statistical protagonists, it's far easier to make sense of the mathematical solutions they came up with. And the resulting mathematical concepts are defined rigorously alongside the drawings and historical anecdotes. This approach of explaining the real meaning, in plain English, of statistical concepts makes these definitions much easier to digest. So if you're nurturing an amateur interest in statistics, then this book offers an entertaining dip-in-and-out way of getting your head around some of the central concepts. For the more serious student, it makes a great companion to your old-school text book." Amazon rankings for books are always a little disconcerting, but in July 2010 in Germany, Introducing Statistics is listed as third most popular book sold in the 'Comic Novel Category' and second on the French Amazon website. Statistics is a nightmare especially for students who must pass a basic course in mathematics as they just do not relate. This book is unlike many statistical handbooks entertaining reading, but also an introduction to a funded field. The author illustrates her history in statistics, basic concepts of different approaches to organizing and summarizing data, a key personalities on the border of the science of sociology and mathematics, going forward, and discusses the main approaches to individual schools. All in all an attractive design of its illustrations, photographs and collages. Eileen Magnello teaches statistics at University College London. Borin Van Loon is the illustrator of a number of books [including] Psychotherapy, Sociology, Eastern philosophy. Chris Horrocks & Zoran Jevtic - Introducing Foucault: A Graphic Guide. 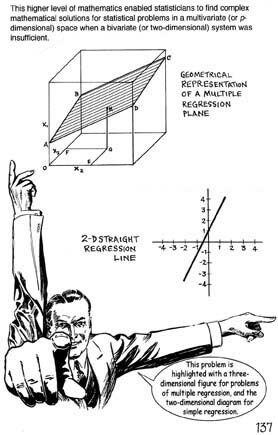 Eileen Magnello & Borin Van Loon - Introducing Statistics: A Graphic Guide. Click here to see the artist give away all his secrets in an illustrated blog about the making of 'Introducing statistics' on Icon's 'Introducing' website - look out for the 'Author Spotlight' link.